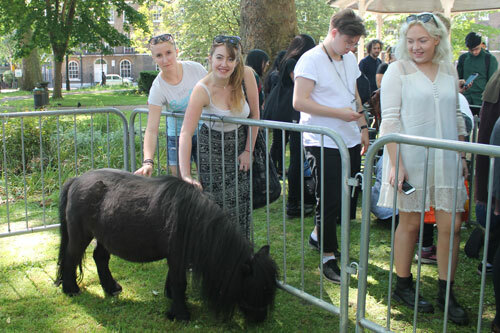 The City Students’ Union’s Study Well Campaign kicked off in style this week with a petting zoo taking centre stage in Northampton Square. This year marked the third instalment of Study Well, a four week campaign introducing therapeutic activities to students and encouraging mental wellbeing around exam periods. 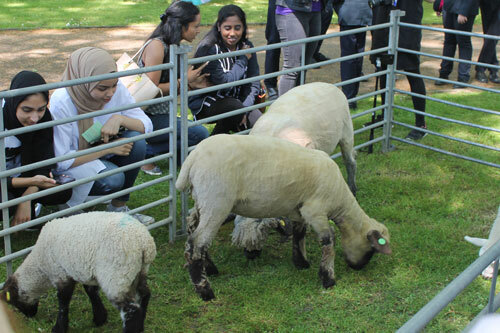 The campaign opened with mindfulness meditation sessions and a petting zoo, including sheep, rabbits, chickens, guinea pigs and a Shetland pony, all from Surrey Docks Farm. Sasha Blackmore, (BSc, Psychology, first year), said: “I come from the Southwest of England, so seeing animals reminds me a bit of home, but this is probably the first time I have seen farm animals in London. “I had one exam yesterday, and now I have four more over the next few weeks, so it is quite easy to get bogged down in revision and that can really affect your mental health. However, it is great to come outside and take a break from the books, and when animals are involved it is even better! Throughout the campaign, there will also be a dog cuddling room, create your own lip and beard balm workshops, Jamaican dancehall sessions, yoga sessions and activities promoting mental health and wellbeing. A full schedule for the campaign can be found on the Students’ Union website. City has a wide range of support student support services which can be contacted at any time. For more information visit the student counselling and mental health pages.